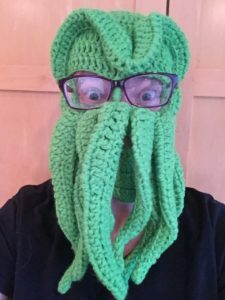 What Does the SFWA President Actually Do? 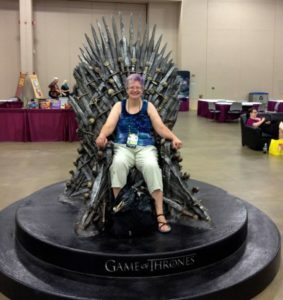 My last day is June 30, 2019, wheeeeeee, after which I will have been Vice President of the Science Fiction & Fantasy Writers of America (SFWA) for one year, and President for two two-year terms, adding up to the sum of five consecutive years on the SFWA Board. Thank goodness for term limits. The Elections Committee asked me to do a write-up of what the role involves, which was an interesting exercise in reflection about what all I’ve done over the past time on the Board, and I thought that might be of general interest to the F&SF community at large as well, particularly because SFWA has evolved so rapidly in the past decade, including the admission of indie, small press, and game writers, the implementation of dozens of new initiatives, and the explosive growth of the Nebula Conference Weekend. So here’s an expansion of what I sent our Elections Commissioner Fran Wilde. 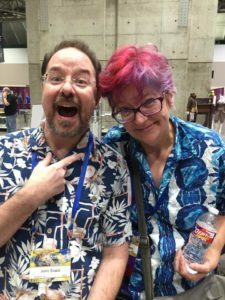 The President is one of the major faces of the organization, and should be willing to attend events such as the Nebulas and conventions as well as representing SFWA at the other events they’re present at. 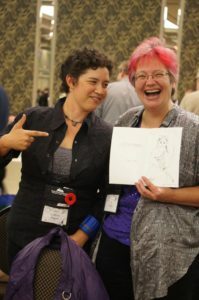 (When signing up for conventions, I usually pitch a SFWA meeting and/or “What Can SFWA Do For You?” panel, for example.) As such, they do need to bear in mind that anything they say on social media or in interviews may be taken as having “of SFWA” appended to it, whether or not they want it to. The President carries this more than board members, and needs to remember that the membership may interpret something they say jokingly on Twitter as indicating the overall board’s opinion. Having a disclaimer that your opinions are personal and do not represent the organization on places like social media profiles is vital. Photo by Richard Man. 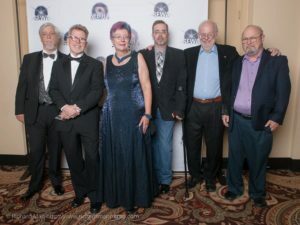 Left to right: Michael Capobianco, Steven Gould, Cat Rambo, Russell Davis, Greg Bear, Joe Haldeman. A good President will be familiar with the bylaws and OPPM and work to bulletproof the organization against anyone wishing to do it harm. 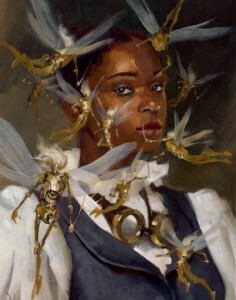 They must work side-by-side with the board, the Executive Director, the Deputy Executive Director, the financial team, and a slew of volunteers and contractors to make sure that SFWA remains true to its mission while growing and adapting to the evolving and ever-changing publishing landscape. In order to do that, the President needs to keep an eye on what’s going on–which can be difficult at times, given the volunteer nature of the position and the stressors of life. They need to be available to people who need them or arrange someone to cover them when on vacation. But it’s also usually easy to keep up with things and often just a matter of checking in on the discussion boards and e-mail once or twice a day. I do want to note (from experience) that many e-mails are time sensitive and not paying attention can result in holding things up in a frustrating way for other people. John Scalzi, Cat Rambo. Hawaiian shirts are not mandatory for the President, it only seems that way. The President also needs to make sure the other Board members also stay on top of things and they work in tandem with the VP to ensure things remain on task. One tradition that’s been implemented are regular weekly video calls with the Executive Director, Deputy Executive Director and SFWA Board. These last 15 minutes to an hour and are pretty low-key. I’m going to miss seeing those friendly faces and getting to compare notes. There is also a monthly call with the Volunteer Wrangler, frequent calls and texts with Griefcom, and sometimes the need to sit in on calls about legal matters when, for example, a scam publisher decides to try to intimidate Writer Beware into removing an advisory about them, which happens every few months. (My policy has been to be very assertive legally in replying to these; SFWA has the funds to defend itself and I want to make it clear to these folks that Writer Beware won’t play their reindeer games.) It should be noted — although it may be obvious by now — that there is a requirement to have Internet access should you decide to run. The President needs to review the financials in a timely fashion when they are presented to them by the financial team along with the rest of the SFWA Board. Sometimes they will need be able to sign off on decisions with some authority as well as make informed decisions on their own. They have a small discretionary fund; I have used mine on outreach and learning and funding some minor low-cost projects, usually some form of volunteer recognition. I did use a chunk one year to attend a conference on non-profit fundraising, which was fascinating. Goldeen Ogawa, Cat Rambo. Photo by Brenda Cooper. The President should be willing to attend events such as the Nebulas and conventions as well as representing SFWA at other conventions and conferences. They must attend the various receptions and functions–including the Volunteer Breakfast and Spouse/Partner party at the Nebulas. At conventions and particularly the Nebulas, the President should pretty much figure 90-100% of their waking time will be devoted to SFWA-related stuff and spent networking and engaging the membership, along with leading Board and business meetings, spending time in the SFWA suite or table if there is one, and participating in SFWA-focused programming. The President must know the organization, its resources, and the frameworks around those resources. There is a constant flurry of people asking for assistance or guidance with communications coming in through a multitude of channels, including telephone, e-mail, and social media, and 90% of the time it’s a matter of steering them to the right place, whether it’s the office, the Emergency Medical Fund, the ombudsman, Griefcom, or something else. The President needs to not give into the temptation to Do All the Things, because there will be a constant stream of people bearing all manner of projects, many of them things that really do need to be done. Therefore the President needs to be someone good at working with or steering people to the Volunteer Coordinator to find roles for volunteers that will be rewarding for both sides as well as working with the Volunteer Coordinator to make sure volunteers are getting recognized. The President needs to be a good leader, mindful of the varied needs of the membership, and willing to put energy into learning in order to fulfill the organization’s needs as well as occasionally set the organization above their own interests and/or ego. Patience is important; kindness is vital. It is one of the most rewarding — and occasionally the most frustrating — roles I have filled in my life and I am deeply grateful for the opportunity to have done it. Will I come back? Not anytime in the next few years, but I will continue to do volunteer work with the organization. =) However, I’ve been putting my own writing on the backburner a bit while doing this, so I’m looking forward to putting that back into my work. 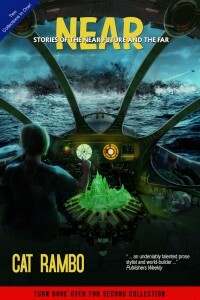 Look for lots of new words in 2019, including a new Tabat book, at least one collection, more on the space opera series, and the launch of a self-pub effort I’m excited about! 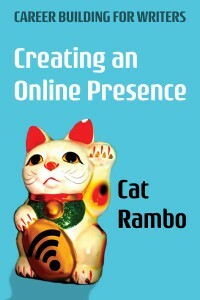 Cat Rambo lives, writes, and teaches by the shores of an eagle-haunted lake in the Pacific Northwest. Her 200+ fiction publications include stories in Asimov's, Clarkesworld Magazine, and the magazine of Fantasy & Science Fiction. Her story, "Five Ways to Fall in Love on Planet Porcelain," from her collection Near + Far (Hydra House Books), was a 2012 Nebula nominee. Her editorship of Fantasy Magazine earned her a World Fantasy Award nomination in 2012. 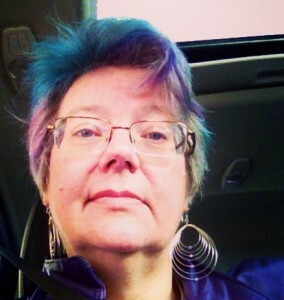 She is the current President of the Science Fiction and Fantasy Writers of America (SFWA). She is currently working on Exiles of Tabat, the third book of the Tabat Quartet. 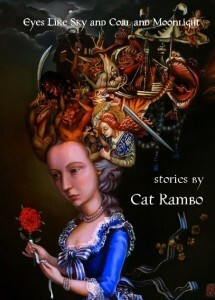 A new story collection, Neither Here Nor There, appears from Hydra House this fall. This entry was posted in SFWA and tagged #sfwapro, SFWA. Bookmark the permalink. Thank you, Cat. SFWA has been in excellent hands under your leadership.